Being smack-dab in the middle of horse country meant a scenic trip down Bryan Station Road to get to the Windy Corner. Worries about potential rain dogged our drive for a short time, but it’s easy to forget things like that when you have someone with a personality as vibrant as our guest for this Foodie Friday, Kimberly Leslie! 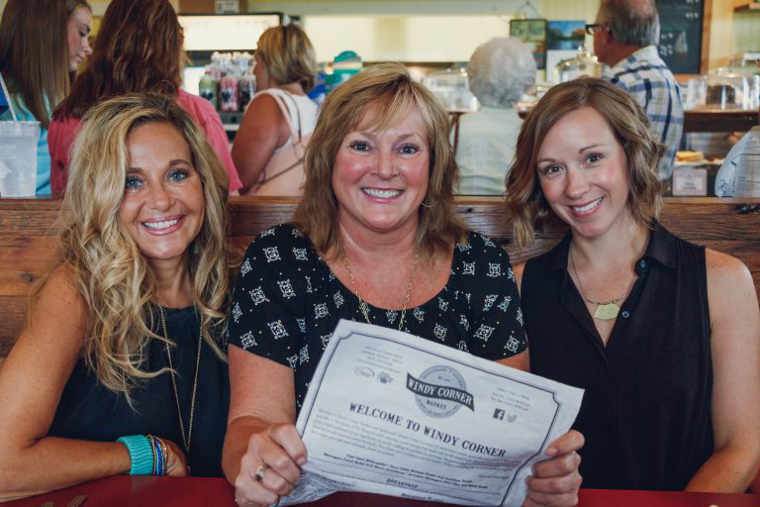 Windy Corner Market definitely has plenty of Southern flavor, so we knew Kimberly would be our gal for this outing. 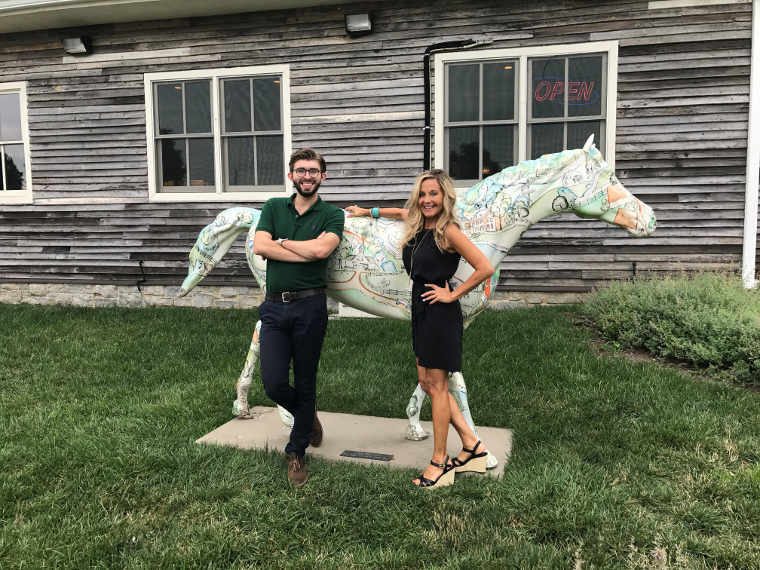 When we arrived at 11:30 am, we were greeted by one of Lexington’s limited, decorative thoroughbreds and a line already spanning from the end of the counter to the door, which only got bigger the longer we were there. So if you plan on going for lunch, get there early! With one mention of the Fried Pickles appetizer, we were all in firm agreement that those were a must to try. For our entrees, we ordered the Chicken Salad Plate, Old-Fashioned Chicken Fingers Basket, the Kentucky Boy and the Big Blue Burger (without a bun, just how Kimberly wanted it). We had to wait a bit for the food since it was all being made fresh in the kitchen during the lunch rush, but time seemed to fly as we enjoyed laugh-inducing conversation amongst the welcoming Lexingtonian atmosphere of the Windy Corner Market, with walls adorned by jockey jackets and shelves lined with local products. Once our fried pickles came, we were like sharks that smelled blood in the water, but keeping manners in mind, we each put a few on our plates with some of the dipping sauce and ate politely with our forks. 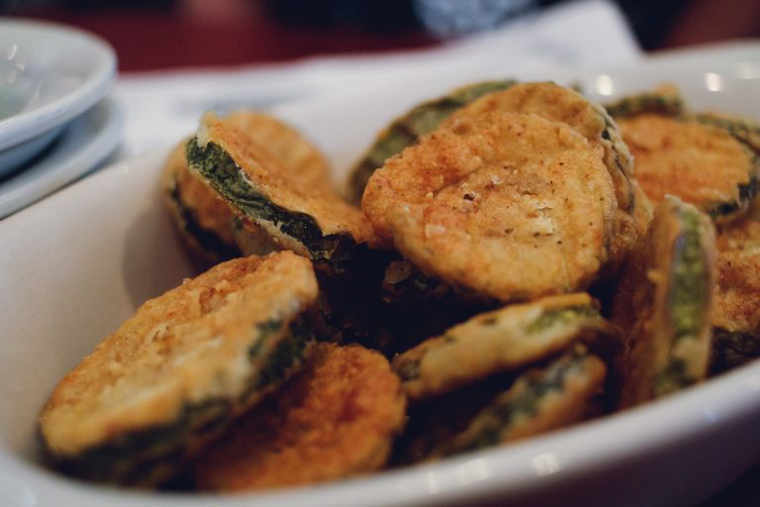 The fried pickles were SO GOOD, though, that we quickly devolved to just picking them right off the plate with our fingers and dunking them in the Smoked Tomato Ranch dipping sauce. 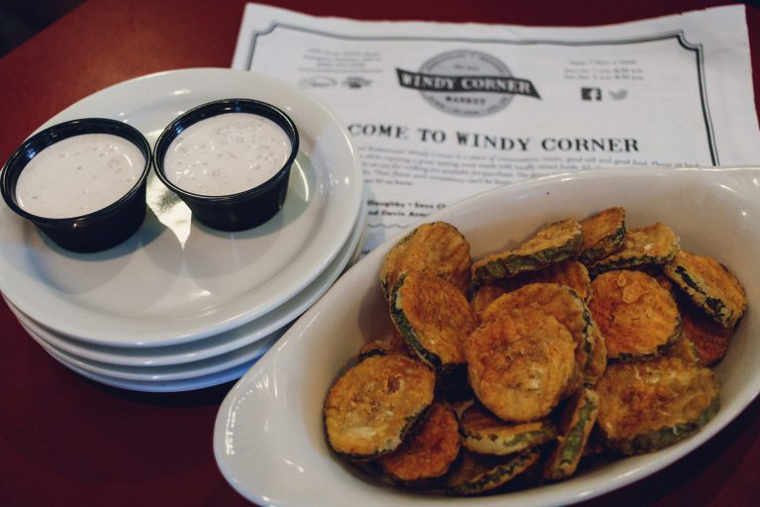 We collectively decided that they were the BEST fried pickles any of us had ever tasted (I’m even drooling right now as I write about them). When our food came out, we were all ready to dig right in again. 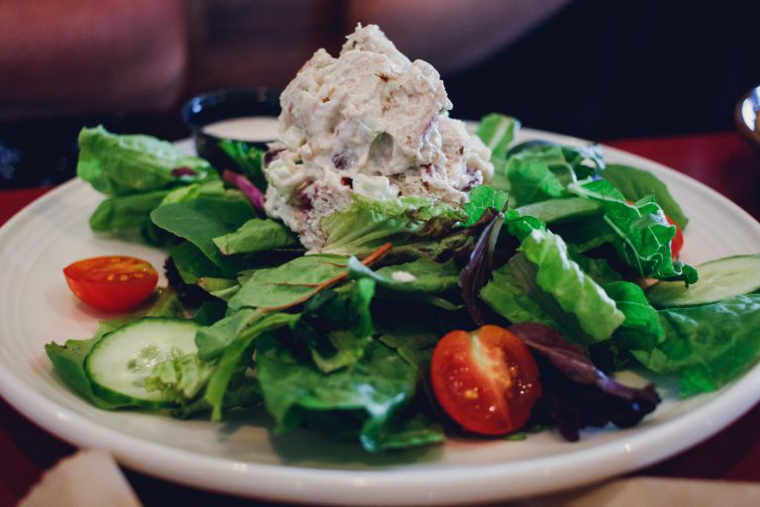 The Chicken Salad Plate had locally grown, organic veggies that paired nicely with the creamy, old-fashioned chicken salad made at Windy Corner’s sister restaurant Wallace Station in Midway. The Old-Fashioned Chicken Fingers came out piping hot and tender! It was obvious from the first bite that these were no run-of-the-mill-made-for-a-five-year-old chicken fingers. 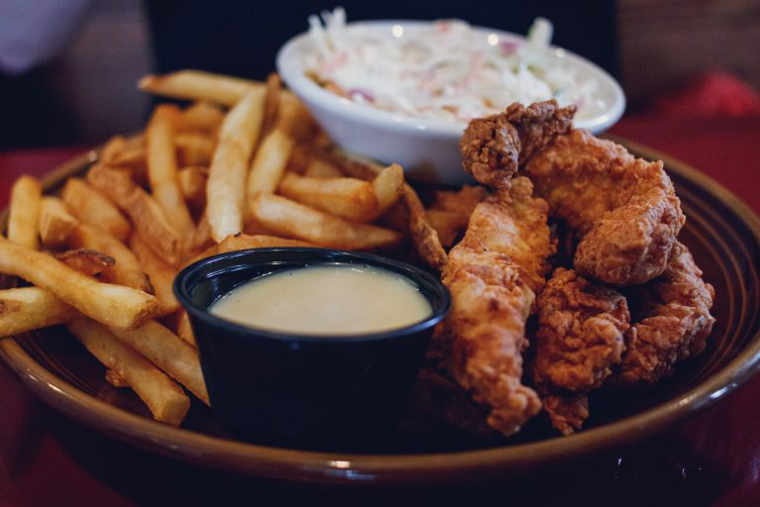 You could taste the hand-battered quality of the crispy breading, and we all know that’s what makes a good chicken finger, a good chicken finger. If you have a soft spot for pimento cheese, the Big Blue Burger is a prime choice. The burger was perfectly juicy, and the bourbon bacon jam was so delicious that Kimberly wanted to buy some to take home! 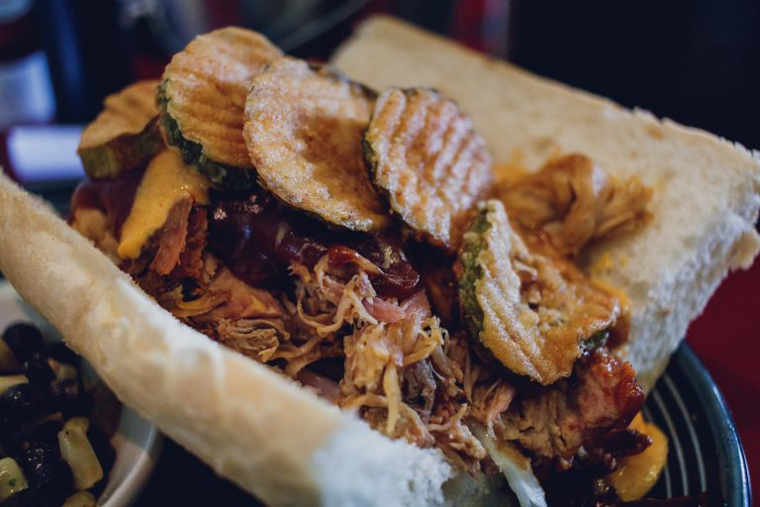 The pulled pork on the Kentucky Boy was great and the bourbon barbecue sauce paired perfectly with the bourbon barrel beer cheese oozing over the sides. Plus, it was topped with more fried pickles (YES)! 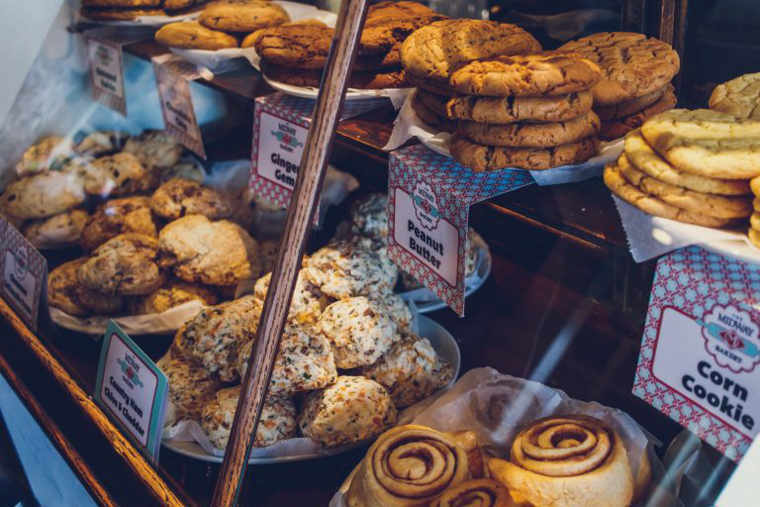 We were all absolutely FULL once we finished, but we had to try some of the cookies from Windy Corner’s Midway Bakery that are made by hand with real ingredients. We wanted to try a more traditional favorite, but also wanted to try one that was a bit out of the ordinary, so went ultimately went with peanut butter and corn. The peanut butter was quite good, but we couldn’t stop thinking about that it would’ve been even better with chocolate of some sort also in the cookie. The corn cookie had a great buttery, sweet flavor, which reminded us of both cornbread and snicker doodles, but might not be for everyone (our party was torn over whether the peanut butter or the corn cookie was better). Regardless, they’re definitely worth trying and sharing with a friend! 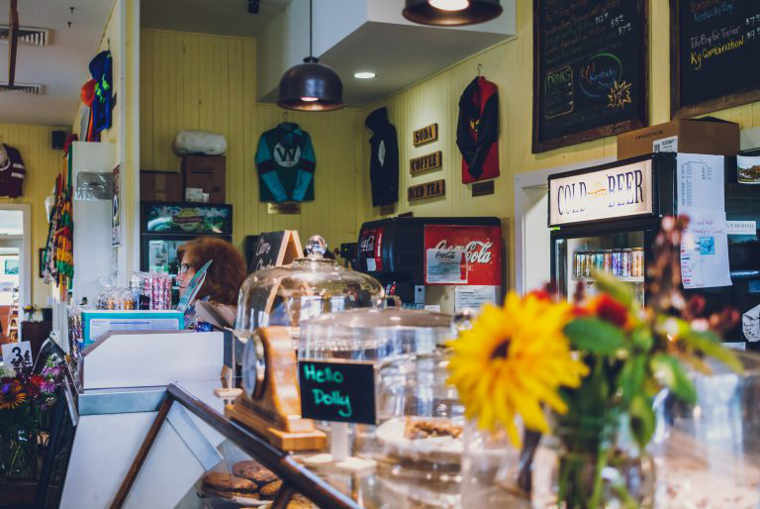 Our lunch at Windy Corner Market really blew us away, and we’re sure it’ll do the same to you! If you love to enjoy fresh, local food in an atmosphere that is unique to our great city, then don’t wait to have a meal at the Windy Corner, but make sure you get there early enough to beat the crowds! Open Monday – Friday 7 a.m. to 8:30 p.m.
Saturday – Sunday 9 a.m. to 8:30 p.m.